Students gathered in the Munster University Center (MUC) pit lounge on Thursday to watch the Blasey-Kavanaugh Hearing. The political science department reserved the space for students to watch the hearing throughout the day. Faculty stopped by to add insight, answer questions and lead a discussion. Marcus Ireland, a senior criminal justice, political science and philosophy triple major said he thought the guidance from faculty was beneficial to the student body. 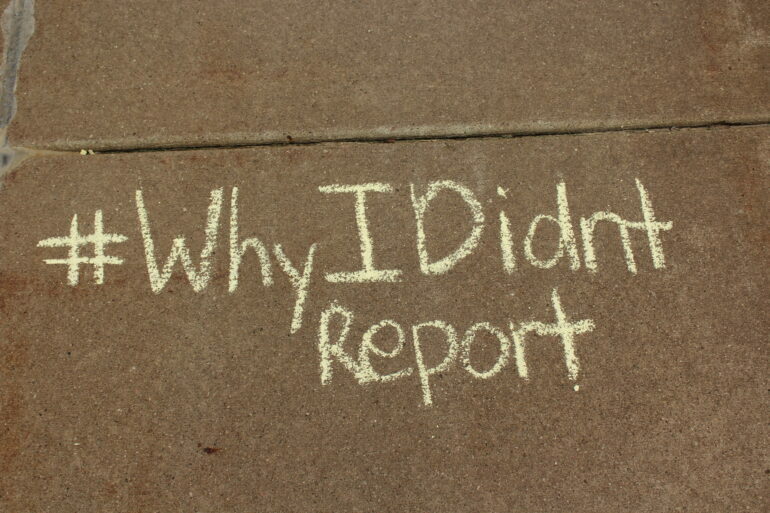 Alyssa Fothergill, president of PAVE, said PAVE collaborated with Bridget Diamond-Welch, an assistant professor of political science, to organize a campus event where students could chalk #whyIdidn’treport messages on campus sidewalks. Fothergill said it was important for PAVE to do something to support students. Members of PAVE were also in the PIT lounge on Thursday with resources available for survivors of sexual assault. “There was resources provided on a table in the pit and many students and faculty did pick them up,” Fothergill said. David Earnest, chair of the political science department said the idea to host a viewing in the MUC started by department faculty wanting to make the hearing available for students to watch in Dakota Hall. After discussing options, the department decided to find a place that could hold a larger audience. Unsure if the hearings would happen, the department waited until Wednesday afternoon to announce they would be playing them in the MUC. Even though no speakers were planned, faculty from many departments stopped by and used the breaks between questioning to speak with students, Earnest said. President Gestring even stopped by the event to see students before she gave her first State of the University address. Ireland said the last time he saw this much student interest in national politics on campus was the 2016 election. Earnest said the political science department is planning on hosting another viewing for the midterm elections on Nov. 6. Ireland said he thinks events like Thursday’s are beneficial to the community. “I think it was beneficial for the department in the sense that it brought us together, but I also think it’s better for the community because it helped to provide a more insightful viewing, versus just a political viewing,” Ireland said.